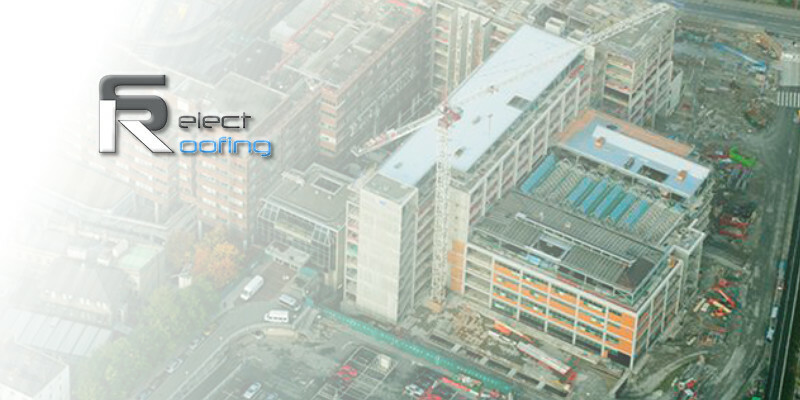 Select Roofing was chosen to design and install the roofing on the refurbishment and extension of the Mater Private Hospital in Dublin. This major project entailed the recovering of existing department and clinical rooms as well as a major three-storey extension being newly built. For the refurbishment of the existing roof the concerned areas of the hospital were to remain “live” and fully functional with no disruption to the day-to-day functions of the departments. With this in mind a non-flammable Kemperol cold-applied liquid roofing system was used which would remove the risk of fire or heat-related problems caused by heat-guns, bitumen boilers or other general bonding implements. The work would be carried out in a stage-by-stage process with the existing roof being stripped and replace in sections. As cold-bonding is extremely weather reliant all available time and materials had to be co-ordinated and optimised to a high degree to ensure premium efficiency. On the extension a Paralon bituminous felt built-up system was installed.